The gauntlets are galloping along! But what ever I ultimately decide—I am more than half way done! And more than 90% done with the first ball(s) of yarn. Looks like each gauntlet will require about 1.25 or so balls of yarn. The extra be put to work as a scarf--or cowl or gaiter or smoke ring.. or something for around the neck! 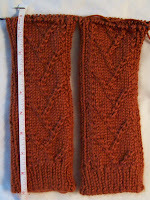 4.5mm, but since the bulk of the gauntlet (the back and sides) are ribbed, I am working on a size 6/4.25—with 48 stitches. 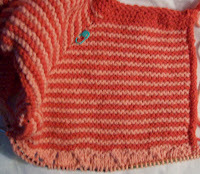 Operationally –2 on 2 circ’s—it feels like socks.. but these are knitting up faster than any socks would! At home last night, the bias ribbon socks are out of sight, and out of mind. But Peachy (as I have come to call it) is progressing—the colors in this image (on my monitor at least!) are closer to the actual colors. The yoke is finished, the sleeves separated and on a stitch holder (a spare circ actually) and the first repeat of the lace pattern is done. I found a lace pattern with a very VERTICAL effect --intentionally--to provide contrast to the very HORIZONTAL stripe in the yoke.